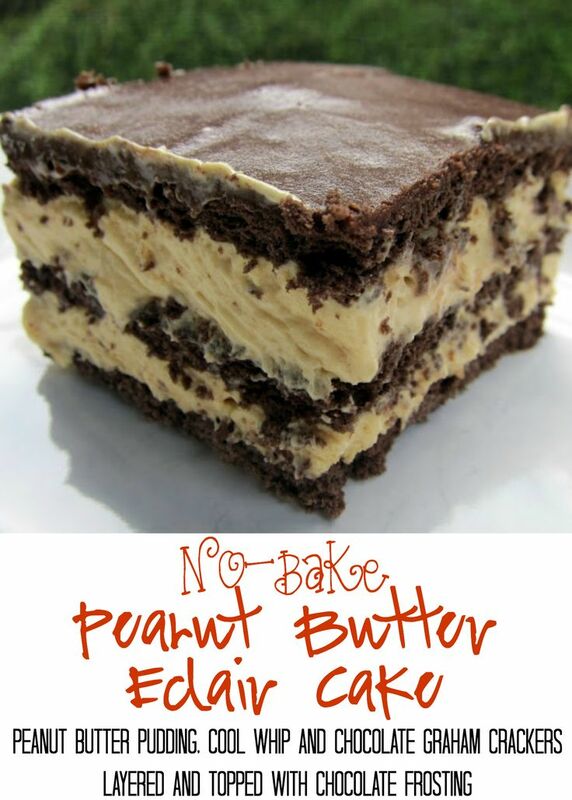 No-Bake Peanut Butter Eclair Cake Recipe - peanut butter pudding, cool whip and chocolate graham crackers layered and topped with chocolate frosting. It gets better the longer it sits in the fridge - it is just SO hard to wait to eat it. SOOO good. People go nuts over this easy dessert recipe! I have to give credit to Chicken Legs for this recipe. One of his favorite desserts is my Chocolate Éclair Cake. The last time I made it he suggested that we try a Peanut Butter Chocolate Éclair Cake. I happen to love peanut butter and chocolate, so I thought that was a fantastic idea!! I made a few simple changes to the original recipe and we had our creation. It was absolutely delicious! We both loved it. It is so light; it is hard to stop eating! I always make this the day before I want to serve it. It gets better the longer it sits in the fridge. Spray the bottom of a 9x13 pan with cooking spray. Line the bottom of the pan with whole graham crackers. In bowl of an electric mixer, mix pudding with milk and peanut butter; beat at medium speed for 2 minutes. Fold in whipped topping. Pour half the pudding mixture over graham crackers. Place another layer of whole graham crackers on top of pudding layer. Pour over remaining half of pudding mixture and cover with another layer of graham crackers. Heat the container of prepared frosting, uncovered in the microwave for 1 minute. Pour over the top of the cake. Refrigerate for at least 12 hours before serving.